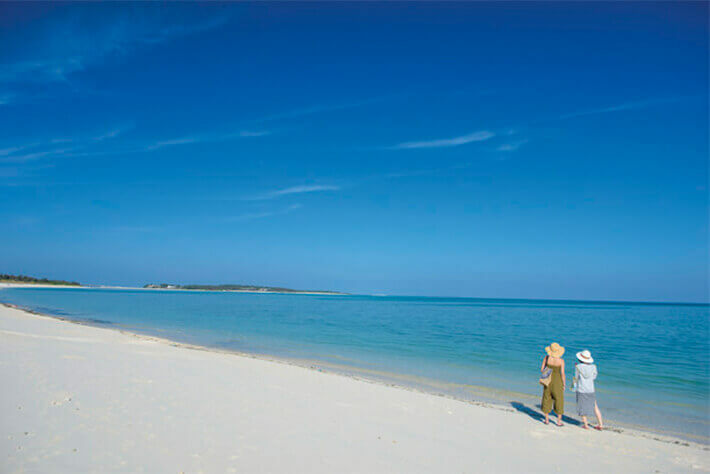 Kume Island is approximately 30 minutes by air from the main island of Okinawa. 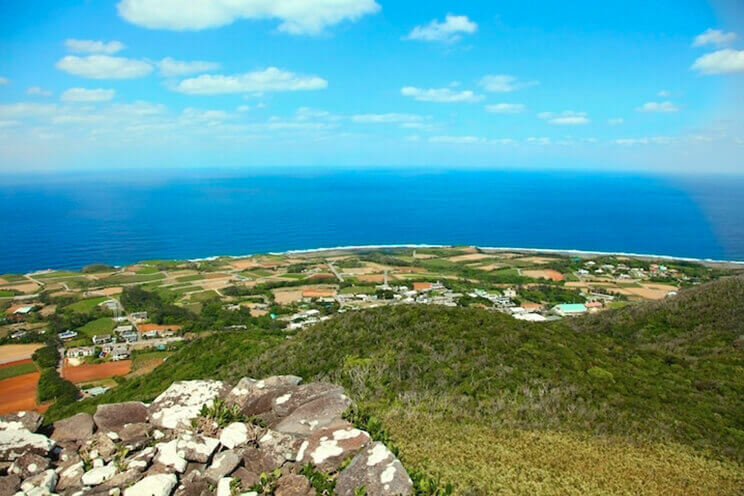 During the dynastic era of Ryukyu Kingdom, Kume Island was regarded as being particularly beautiful among the numerous islands and praised as “Kumi no Shima (Island of Ryukyuan Beauty)” for its abundant nature. 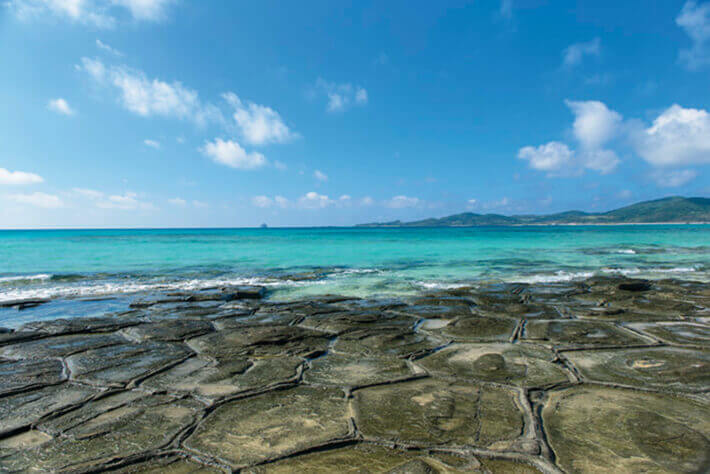 Almost the entire island has been designated as a prefectural natural park, from the stunning contrast between the bright white sandy beach that stretches nearly 7 km on the eastern shore and the emerald green ocean at Hate no Hama Beach to the unique paving stones that resemble turtle shells covering the sandy beach, Kume Island has a very distinct scenic appeal to offer. In addition, the Kuroshio Current off the coast of Kume Island harbors a rich fishing ground, making the island quite popular among fishermen as well. 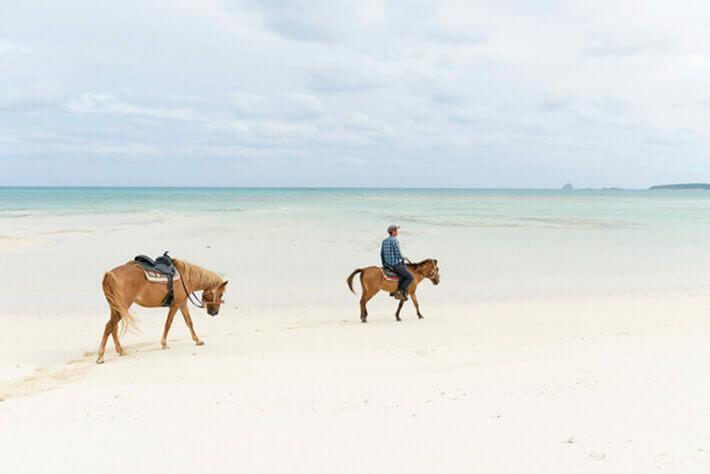 Kume Island is also known for the farming of Japanese tiger prawn and seagrape, utilizing the deep-sea water, which attracts foodie travelers. 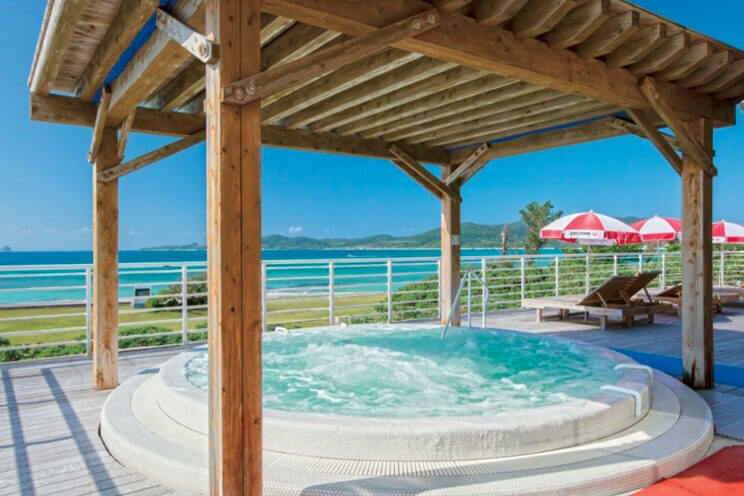 On Kume Island, there is a spa facility built under the concept of a “bade,” a traditional German bath therapy, using mineral-rich deep-sea water pumped from 612m underwater off of the coast. 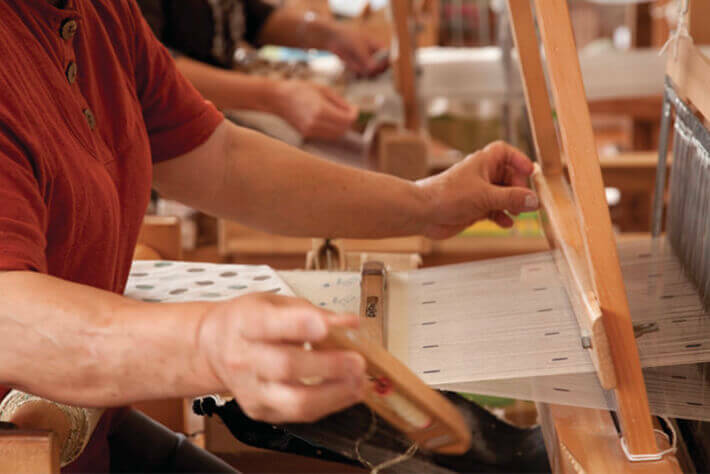 Furthermore, the island offers a wide range of relaxing beauty treatments including facials that generously incorporate locally sourced ingredients from the island. Indulge in the abundant nature on Kume Island and enjoy the slow pace of time flowing on the island, allowing for a special moment to heal the fatigue from everyday life. With its abundance of water, Kume Island is also known for its tasty awamori and agricultural produce. 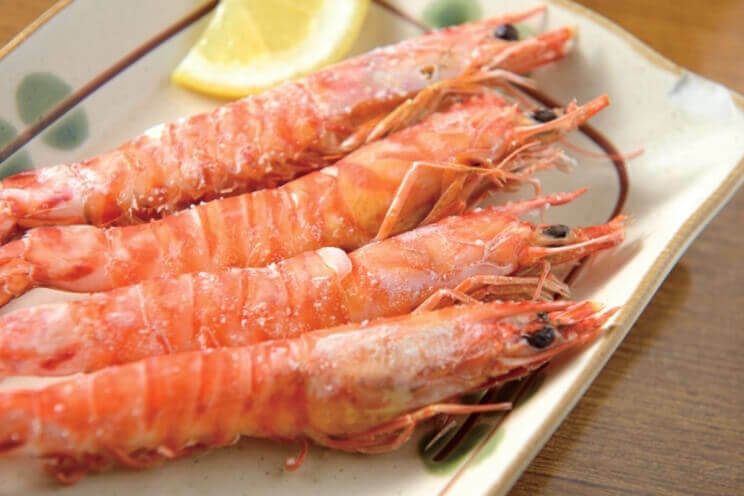 In addition, they are known for their farming of seagrape and Japanese tiger prawn using deep-sea water that is rich in minerals and pure, both of which Kume Island boasts the largest production in Japan. Kumejima Akadori is a type of branded chicken raised on feed that contains unrefined awamori dregs and Okinawan herbs that is rapidly gaining popularity. There is also abundant seafood caught in the rich fishing grounds, making Kume Island one of the gourmet islands of Okinawa. During the dynastic era of Ryukyu, Kume Island flourished as a key part of the trade routes between Mainland China and the Ryukyu Kingdom. 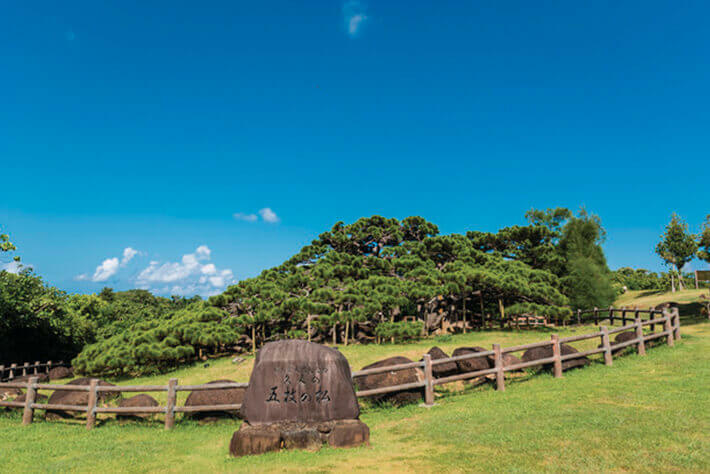 On the island, there are the four castle ruins including Uegusuku, Gushikawa, Tonnaha, and Chinaha, and from these ruins, coins and porcelain from Mainland China have been discovered, highlighting the prosperity of the time. Among these ruins, Uegusuku Castle stands at an altitude of approximately 310m, the highest in Okinawa, where you can overlook nearly the entire island, and on a sunny day, you can even see Hate no Hama Beach and the surrounding islands, making it quite the scenic spot. Naha airport > Kume Island airport (approx 30 mins). Ferry: Tomari Port, Naha > Kanegusuku Port, Kume Island (approx 3~4 hours by ferry). Size / Population: 59.11km² / approx population of 8,228 people.